One day King Arthur is out hunting in the North, in Inglewood Forest, where he stalks a white hart until he wounds it with an arrow. Just as he goes to gather his kill, a monstrous fellow steps out of the woods. He calls himself, “Sir Gromer Somer Jour” and threatens Arthur instantly with death by his ax. Shaken and confused, Arthur responds that he is unarmed for battle, and Sir Gromer grants him a twelve-month span in which to answer a riddle or return for his death blow. King Arthur departs this encounter entirely crestfallen and confused about the intent of the riddle. Both Gawain and Arthur suspect this question is a trick because it seems so inconsequential. Gawain is optimistic, however, saying “After all, we have an entire year to collect answers throughout the kingdom. Surely someone will know. “ Arthur is less certain. For an entire year, Arthur and his companions set about gathering data in their notebooks, asking the question of a broad and diverse sample of their population. Ultimately, they come together and compare notes, Gawain feeling certain that one of the answers will be right. Arthur doubts and worries, secretly assuming that no answer can be found to such a ridiculous question. With only a few days to go, he meanders again into Inglewood Forest, not too far from the place he originally shot the hart. Out of the woods scrambles a hideous old hag who introduces herself as “the Lady Ragnell.” She challenges Arthur, saying she knows he does not have the right answer to the riddle. Arthur is astounded by her officious manner, and replies that he cannot see how she might be concerned with his business. “The impudence of the woman!” is all he can think. Ragnell presses forward with a confidence that is startling to the king. She insists that only she can offer the correct response since she is the stepsister of Sir Gromer and privy to information that Arthur does not have. Himself unconvinced of the answers he has collected, Arthur finally responds by offering her land, gold or jewels for the right answer. Ragnell refuses his material rewards, replying, “What use do I have for gold or jewels?” and asserts that only one thing will do”: “If your nephew Gawain agrees to marry me, I will tell you the correct answer. 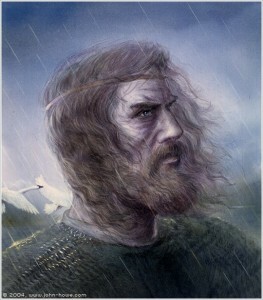 That is my condition.” Arthur says that Gawain is not his to give, that Gawain is his own free man. Ragnell replies that she is not asking for Arthur to give her Gawain: she is only asking him to propose the matter to Gawain and to discover what Gawain chooses to do, of his own free will. Although Arthur asserts that he cannot put his nephew on the spot in this way, he immediately goes back to the castle and makes the proposal. Seeing his uncle almost groveling before him, Gawain cannot but take pity on the poor king and vows that he would wed the Devil himself in order to save the king’s life. Together they go back to Ragnell and Gawain agrees to marry her if the answer she gives them is the one that saves the king’s life. At this Gromer dashes off, spitting hateful remarks about Ragnell and screaming that Arthur could never have found that answer on his own. Arthur, Gawain and Ragnell ride back to the castle in silence. Only Lady Ragnell is in good spirits. There follows a great wedding banquet attended by the lords and ladies of the castle. Everyone is uncomfortable, squirming and commenting on the ugliness and bad manners of the bride. Ragnell, however, is unabashed; she eats heartily and appears to have a very good time. Lady Ragnell explains that her brother had cursed her for being so bold as to disobey his orders. His curse was that she should appear as a loathsome hag until the greatest knight in all of Britain willingly agreed to marry her. Arthur’s mistake of hunting in Inglewood Forest (the land Arthur had given to Gawain, but which rightfully belonged to Sir Gromer) was her first opportunity to be in contact with the king and to try to break Sir Gromer’s vengeful spell. Gawain falls silent. Pondering the intent of the question, but only for a moment. 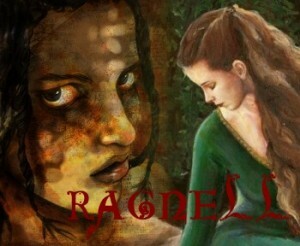 “It is your choice, Ragnell, because it involves your life. Only you can decide, “ is his answer. Thus began the marriage of Sir Gawain and the Lady Ragnell.